Review posted October 1, 2016. 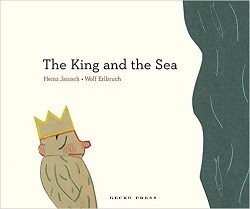 Originally published in Germany in 2008 as Der König und das Meer. Gecko Press, 2015. 48 pages. There’s something Zen about this book. The stories remind me of the child-like logic found in Winnie-the-Pooh. As the title indicates, this book consists of 21 extremely short stories. All of them feature the king. A few feature the sea as well. Each story takes up one double-page spread with a very simple cut-paper illustration. “I am the king!” said the king. The sea answered with a whoosh. “Hmm.” The king cocked his head thoughtfully. And he stood there quietly, listening to the waves. “Why do you have to follow me around?” asked the king. “To stop you from coming up with stupid ideas,” said the shadow. “So there are,” murmured the king, staring at the long dark shadow cast by his small gold crown. “I don’t believe in ghosts,” said the king. “I don’t believe in kings,” said the ghost. “Then one of us must be mistaken,” said the king. “So it seems,” said the ghost, spiriting himself away. That gives you the idea. There’s something peaceful about reading these stories, which are silly, yet wise. I don’t envision using these with a big group – they don’t provoke a big bang. However, these are perfect for one child – or one adult reading to one child – for a cozy, meditative reading experience. I can’t help but love the king.